Since the middle of the twentieth century, visual art has displayed an ambivalent nature, torn between the poles of abstractionism and realism, conceptual and postmodern, classicist nostalgia and the violent provocation for its own sake. This essay builds an argument in favor of tracing a different path for the visual arts, in which art might be able to recover its fullness and universality. 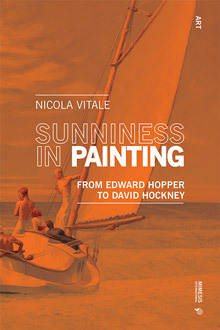 The artists analyzed in this volume – starting with Hopper and Balthus, singled out as precursors – appear to be following this shared path, even though they belong to different generations. Only very recently we have witnessed the emergence of a radical change of perspective, which refounds our notions of aesthetics: according to Vitale, there exists a timeless dimension of art that can only emerge from the work itself, from special techniques where opposite elements become reconciled. As in the art of Ancient Greece or the Middle Ages, as well as of more remote and exotic cultures, abstract tensions that intensify the visual fi eld can bring simple fi gures to life, radically changing their meaning. Akin to the Medieval scholastics’ claritas, this is a “sunniness”: we’ll have to undertake a tireless process of exercising our perceptions, if we wish to be able to grasp its basic aesthetic quality and overcome the narrow historicism that dominated the twentieth century. Nicola Vitale was born in Milan in 1956. He is poet, painter and essayist. His recent essays include Figura Solare. Un rinnovamento radicale dell’arte. Inizio di un’epoca dell’essere (2011), Arte come rimedio. L’armonizzazione delle facoltà umane nei processi espressivi (2013), La “solarità” nella pittura, da Hopper alle nuove generazioni (2014), Arte classica, moderna e contemporanea. Un confronto attraverso le immagini (2017).